← How to use the picture in a pdf file as my PowerPoint background? How to modify description information of pdf? Before transmitting or publishing, you may want to modify the description information, such as the author, the producer, the title and the subject of your pdf document created by other application. Here is the tool for you to modify these descriptions, Advanced PDF Tools, a multifunction software that can edit almost all the document description information that is supported by Adobe PDF format. This article will present a simple example that guides you to modify the description information using the Advanced PDF Tools. You first of all have to download the software from http://www.verypdf.com/pdfinfoeditor/index.html#dl, and install it onto Microsoft Windows Operating System installed computer. The following words will present the concrete procedures to modify the description information of an example pdf file used in this demo. Presented in the following snapshot are the properties of the example pdf file, which shows that the pdf descriptions are all in default values. Here are the procedures to change those descriptions into your preferred ones. 1. 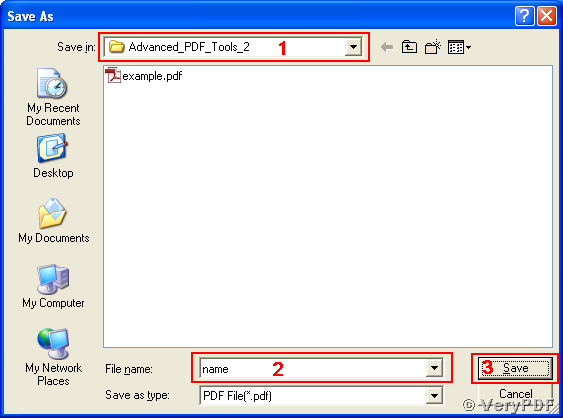 Click the “start” button of your Windows system and browse to the “All Programs” list to find the “Advanced PDF Tools” item and launch the tool executable by clicking the icon of “Advanced PDF Tools v2.0”. 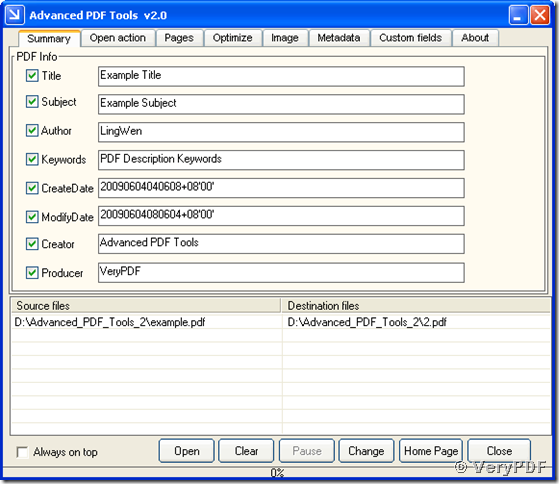 Then the application Advanced PDF Tools is started with GUI. You can also start the program via clicking its name “Prjpdfinfo.exe” in the installation directory. 2. 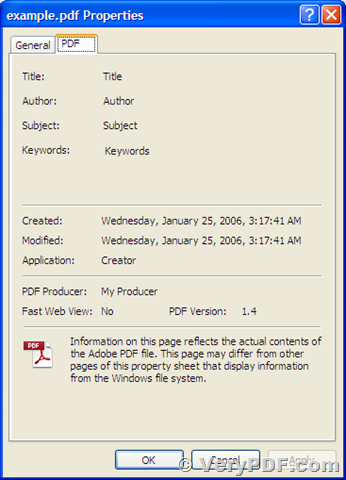 In the opened application main window, you will see a tab named “Summary” where all supported PDF descriptions are listed by the group box of “PDF Info”. Below the group box is a form listing the source documents and destination ones. There are some function buttons in the bottom of the window. 3. 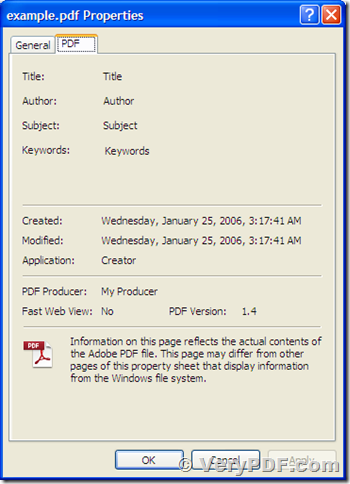 Drag the example pdf file from the Windows Explorer window and drop it into the window of Advanced PDF Tools. The path and name of the example pdf file will be added into the list of the form. 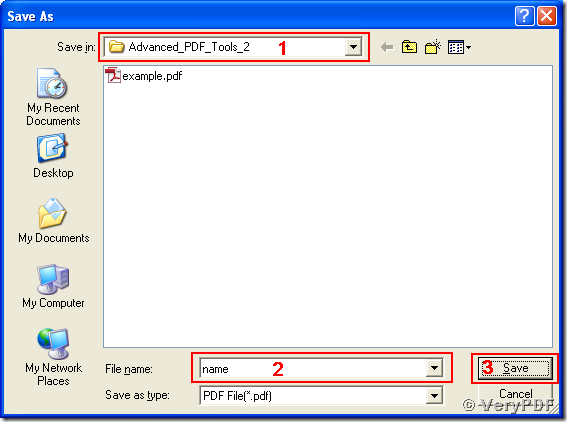 Another method to add the example pdf file is clicking the “Open” button in the main window and select the pdf file with Windows system file picker. The format for “CreateDate” and “ModifyDate” is “YYYYMMDDHHmmSSOHH'mm'”, where “YYYY” is for the four digits of year, “MM” is for the two digits of month, “DD” is for the two digits of day, “HH” is for the two digits of hour, “mm” is for the two digits of minute, and “SS” is for the two digits of second. The time is of Greenwich and “O” is for the signs of time zone (“+” for eastern time zone, “-” for western time zone and “Z” for Greenwich time). “HH” and “mm” following “O” are the time difference with Greenwich time. For more descriptions of the time format, please visit http://www.verypdf.com/pdfinfoeditor/pdf-date-format.htm. 5. Press “Change” button in the GUI and continue to the dialog of “Save As” as follow. Choose the output path in the “Save in” combo box, edit the output name in the editable combo box of “File name” and press “Save” button. All the default pdf descriptions of the example document are now modified into specified ones through the procedures above. The following snapshot of “Properties” dialog shows the new descriptions of the modified pdf document. 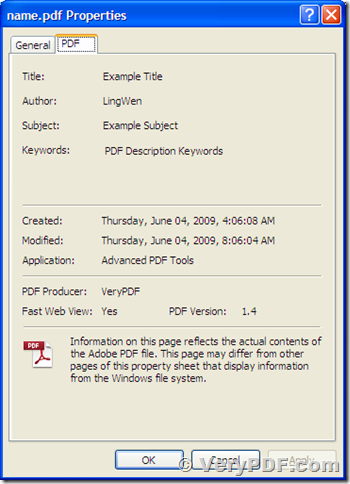 How to add a customized description to a pdf document using Advanced PDF Tools? 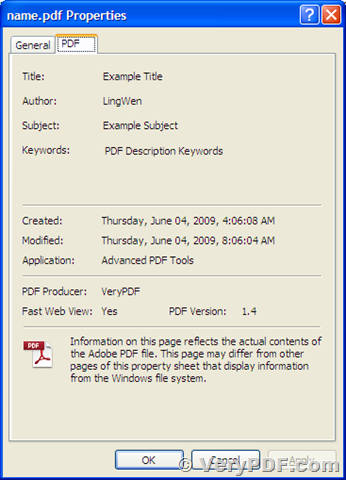 How to add a customized pdf description to a pdf document using command lines? How to rotate skewed PDF with VeryPDF Table Extractor OCR? This entry was posted in Advanced PDF Tools and tagged Advanced PDF Tools, PDF Author, PDF Description, pdf editor, PDF Producer, PDF Subject, PDF Title, pdf tools. Bookmark the permalink.